Shown here are the EB's in attendance at the Kitty Hawk Day dinner in San Francisco, December 11, 1959. Members of the Early Birds in the San Francisco area were again honored at the annual Kitty Hawk Day dinner sponsored by the San Francisco Bay Area Chapter of the National Aeronautic Association and all Northern California Aviation Organizations. 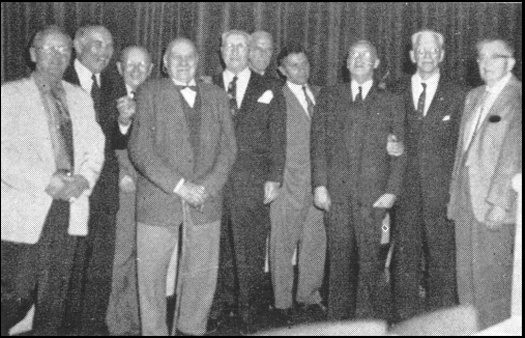 The date was December 11th, the place was the Mart Club, and the occasion was the 56th anniversary of powered flight. Nine members and one prospective member were on hand to enjoy a grand party. They included Hillery Beachy, Harry Christofferson, Frank Coffyn, Dana DeHart, Robert Fowler, Stanley Hiller, Oliver Rosto, Cleve Shaffer, and Anthony Stadlman, together with prospective member J. L. Ray. The excellent dinner and program left nothing to be desired, and EB's enjoyed themselves to the full. Music was provided by the Jimmy Diamond Orchestra. President of the Bay Area Chapter of N.A.A. this year is Col. J. Reed Capps. Early Birds greatly appreciate the genuine welcome and courtesies extended them. A unique feature this year was a card made up by Tony Stadlman containing a sample of sand from the scene of the first Wright flight together with a splinter form the first hangar at Kitty Hawk. Three hundred cards were made up under the Early Bird name and distributed at the places.